Well hello Monday, how did you get here so fast? The weekend flew by, don’t they always? But it was productive, I buzzed around a lot yesterday running errands, cleaning, and tackling laundry for the week. 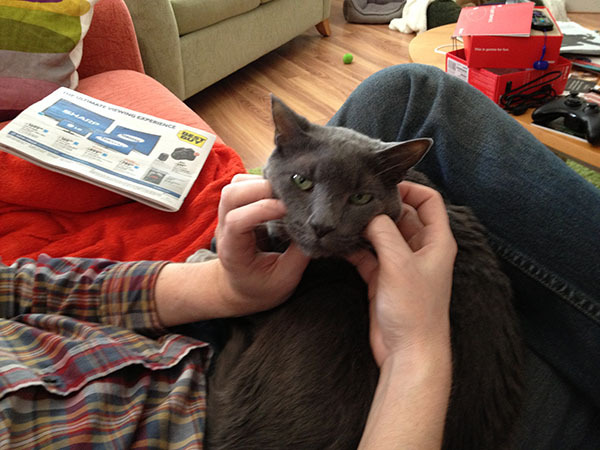 And we got in a little relax time too, Shadow was happy to have hubby’s lap while looking through the paper. 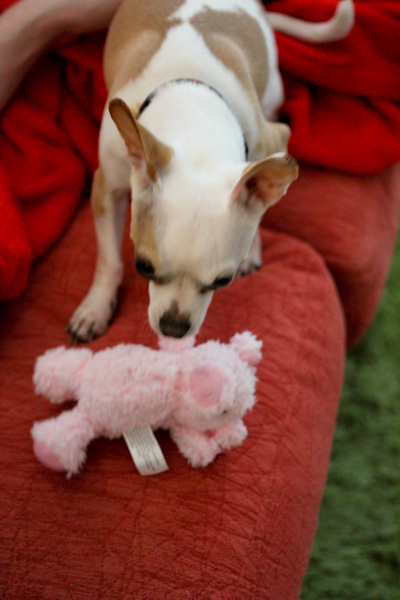 And Miko is happy to have a new toy. 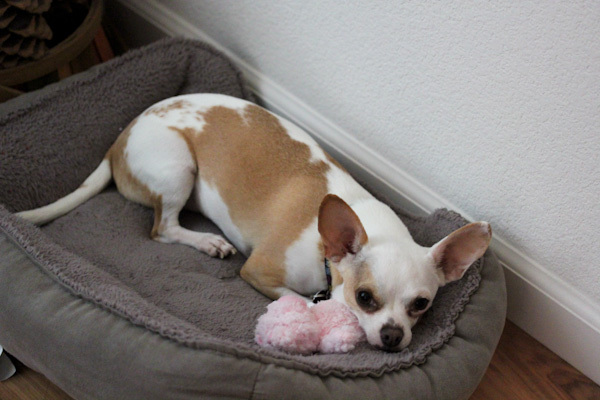 He finally ripped up his stuffed snowman toy, so we picked up a little stuffed pig from PetSmart which he’s thrilled with. My eats have not been too exciting since I’ve been keeping things simple making my usual huge salad to cover lunches for a few days and this super fast curry tofu skillet I threw together Saturday night before heading out to a friend’s concert. 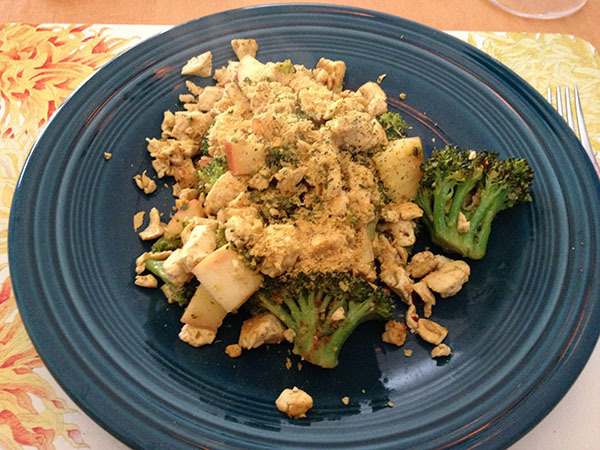 I sauteed crumpled tofu, broccoli, and chopped apple in curry powder, coconut oil, minced garlic, cumin, and red pepper flakes – tasty for just winging it and not following a recipe! And there have been plenty of thick smoothies for breakfast like this one I practically had to eat with a spoon and it was delicious. 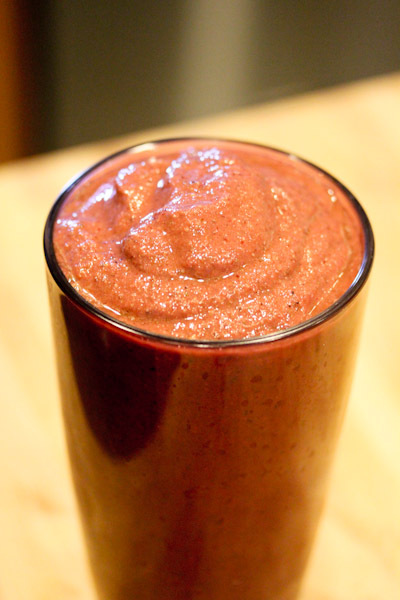 Blended frozen banana, frozen kale, frozen berries, carrots, raw sprouted protein powder, raw ginger chunk, cinnamon, and chia seeds – great combo! I’m always on the lookout for good vegan sushi that goes beyond boring cucumber and avocado rolls and we scored yesterday at Raku Sushi. It’s a unique sushi buffet that makes rolls fresh to order for an all-you-can-eat price and has a nice little salad bar with plenty of edamame, seaweed salad, and cucumber salad. 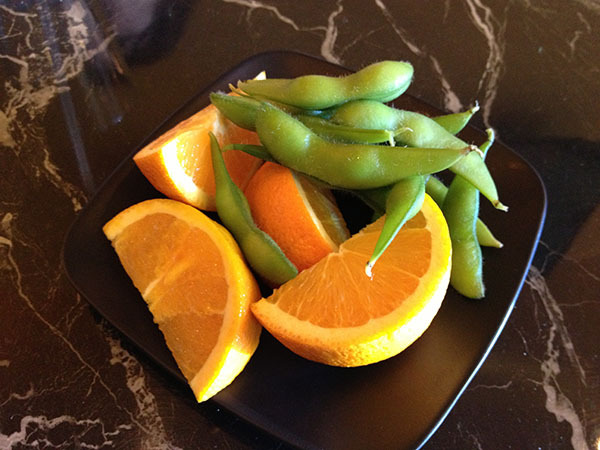 I started with edamame and oranges. 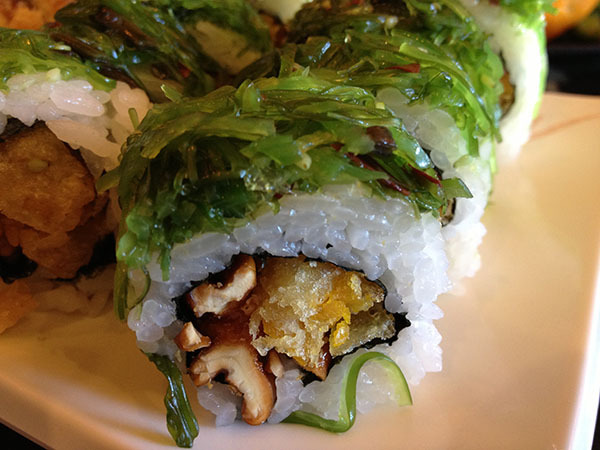 Before diving into the vegan sushi menu where I ordered this gem – a spiced walnut and squash roll topped with seaweed salad. Nothing like the plain old vegan offerings I’m used to and very delicious with a hearty crunchy texture and sweet and savory flavor party. I headed to the mall with my mom after to look through spring sales. Truthfully I’m not much of a mall person anymore, I don’t like spending a lot of money on clothes. 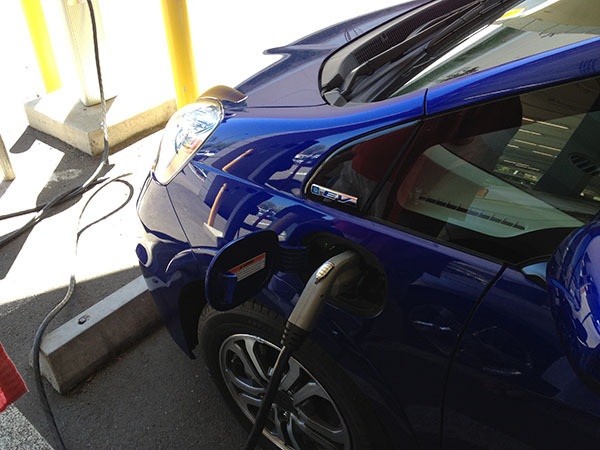 But I wanted to go for one specific reason – to try the free electric vehicle charging stations. That’s geeky, I know. But I’ve been driving an EV for over two months now and this is the first time I’ve used a public charging station. Baby steps, right? That’s how short my work commute is and charging the car at home is costing about a 4th in power of what I was paying for gas with my last economy car. But I could get used to having reserved premium parking and free “gas” at the mall, maybe I need to make more trips to Lush and Pluto’s! 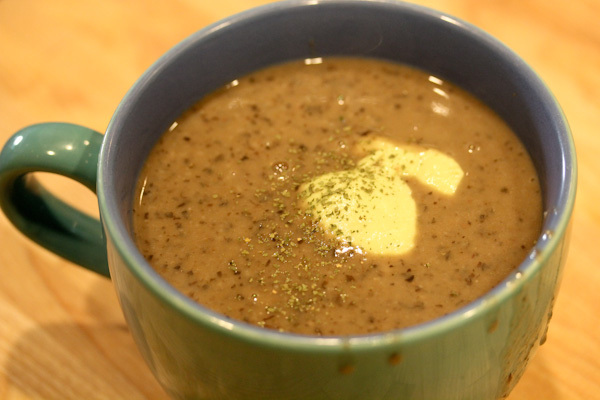 After a busy day of running around, I got the pressure cooker out for a simple dinner creating the Black Bean Soup from The New Fast Food: The Veggie Queen Pressure Cooks Whole Food Meals in less than 30 Minutes. 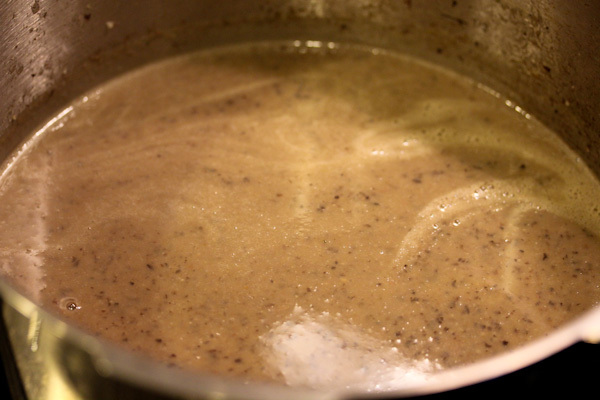 And it was a fun excuse to use our immersion blender I forgot we had to blend the soup after pressure cooking. 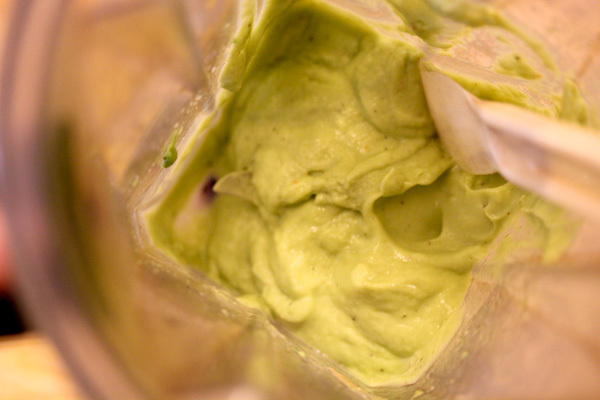 The recipe called for vegan sour cream to top which I didn’t have, so I blended an avocado, apple cider vinegar, salt, and some lemon pepper seasoning for fast sour cream. And it was very tasty in the soup even though the glob sank to the bottom. Thumbs up for the soup, I will make it again. It was a fresher and spicier version of Trader Joe’s Black Bean soup with a heartier texture. And the leftovers were great the next day. Finally, this is an excellent video to watch even though it’s 13 minutes long because it’s a fascinating look at veganism from a long-time vegan doctor who’s 98-years-old! And retired at 95-years-old! 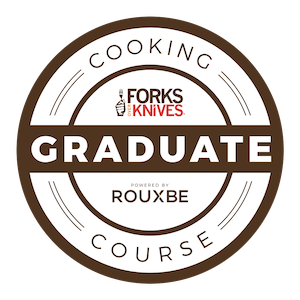 His views on adapting to a plant based diet and how we can develop our own tastes and cravings and how people can be very sensitive about what they eat are very interesting.